Easter is nearing, meaning family time, plenty of food, bank holiday celebrations and a well deserved lie in or two! Try out this deliciously healthy Giving Tree recipe to tantalise your taste buds! A mess you’ll most certaintly want to clear up! To make meringues: Preheat the oven to 200°C. Line a rimmed baking sheet with parchment paper, pour in the sugar, and put the baking sheet in the oven for about 5 minutes, until the edges of the sugar are just beginning to melt. Heating the sugar will help it dissolve in the egg whites more quickly and help create a glossy, stable mixture. Meanwhile, make sure the bowl and whisk attachment of your standing mixer are free from grease. Pour the egg whites into the bowl. Whisk on low speed at first, allowing small bubbles to form, then increase the speed to high and continue whisking until the egg whites form stiff peaks and the bowl can be tipped upside down without the whites falling out. Stop whisking just before the whites take on a cotton-woolly appearance; if they do, they have been overwhisked, and the egg protein has lost some of its elasticity. By now, the sugar should be ready to take out of the oven. With the whites stiff and while whisking again at high speed, add one big tablespoonful of hot sugar after another to the bowl ensuring that the whites come back up to stiff peaks after each addition. Don’t worry about small clumps of sugar, but avoid adding large chunks of caramelized sugar from the edges of the baking sheet. Once you have added the sugar, continue to whisk on high speed for 5 to 7 minutes. Rub a bit of the mixture between your fingers, and if you can still feel gritty sugar, keep whisking at high speed until the sugar has dissolved, the mixture is smooth, and the bowl is a little cooler to the touch. The meringue will continue to thicken up during this stage. You know it is ready to use when it forms a nice, smooth, shiny peak on the tip of your upturned finger. Carefully spoon your meringue mixture into the piping bag, rolling the sides up. You need to pack the meringue mixture in tightly, ensuring there are no air bubbles. Pinch the top of the bag closed, gently pushing the mixture in. If using a disposable piping bag, with sharp scissors, cut the tip of the bag so that the opening measures 7/8 inch in diameter. To get the meringue mixture flowing, twist the top of the piping bag to push the meringue to the bottom. Pipe small dollops onto the four corners of your baking sheets. Line the baking sheets with parchment paper; the meringue dollops will act as glue and stick the paper to the sheets.You are ready to start piping! Hold the piping bag vertically with both hands, securing the twisted top with your dominant hand and placing your other hand halfway down the bag. Use the top hand to apply pressure and the lower hand to control the flow of the meringue. Squeeze the bag to form a small circular meringue with a 2-inch base, and then lift up the bag while releasing some pressure so that the meringue forms a big peak at the top. Space them about 3/4 inch apart. To bake, position racks in the upper and lower third of the oven and preheat your oven to 95°C. Slide the baking sheets into the oven, and bake for 30 to 40 minutes until the meringues are easily lifted off the parchment paper, with their bases intact. Let cool completely on the baking sheets. Stored in an airtight container in a cool, dry place, these will keep for 1 week. To make the raspberry coulis: Put the frozen raspberries in a small saucepan, drizzle in the honey, and set the pan over medium heat. Once the berries are simmering, turn down the heat to maintain a gentle bubbling and cook until lightly thickened, about 10 minutes. Remove from the heat, and let cool slightly. Taste the mixture and stir in more honey if it needs it, but you want the coulis to be quite tart as the meringues are very sweet. Using a blender, puree until smooth, and then let cool completely. To assemble: When you are ready to serve — and only then — start assembling the dessert. If you do this too early, you’ll end up with a soggy mess, not Eton mess. Divide the meringues among individual bowls. 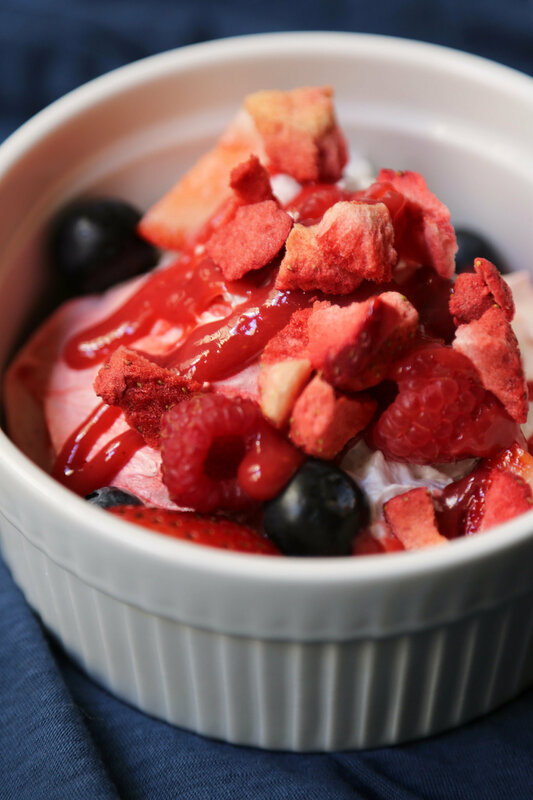 Dollop the greek yogurt around the meringues, and top with the fresh berries. Spoon coulis over everything, and crumble the freeze-dried strawberries over the centers. Serve right away.